University of Southampton students are on track for the world's biggest student motorsport competition at Silverstone from 9-13 July. A team of over 100 University of Southampton students is building a car to race against 114 teams from 38 different countries at Formula Student 2014. The competition - run by the Institution of Mechanical Engineers - challenges student engineers to design, build and race a single seat racing car. 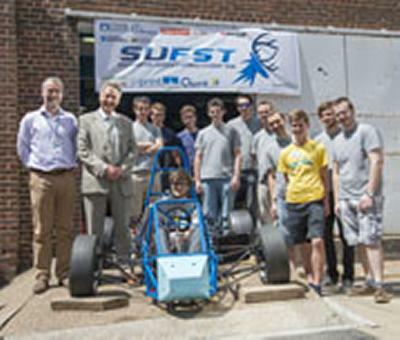 The entire chassis of the SUFST car has been constructed on-site at the university. The team have also made use of 3D printing facilities to produce a new intake manifold for the engine. Also competing at Silverstone will be 61 teams from other UK universities – up from 47 last year - and 53 electric vehicles, a 120 percent increase on 2013. For the first time, teams from China, Ecuador and Jordan will compete, as well as teams from as far afield as South Africa, Pakistan, Australia, Canada and India. Ross Brawn, former Team Principal of the MERCEDES AMG PETRONAS Formula One Team, is also returning as competition patron. Jon Hilton, Chairman of Formula Student said: “It’s brilliant to see teams like SUFST in Formula Student 2014 – it shows that the competition remains one of the most important learning experiences for those aiming to combine their studies with exposure to a real world engineering project.